Commonly called Yarrow, Achillea species such as Achillea millefolium are also known as milfoil. These are a very hardy easy care herbaceous perennial. Achillea are great as dried cut flowers, with strong stems and the ability to hold color well. All species are great border plant, a range of bright colours from white through pink and red. Upright growing and self supporting these are a very easy plant for the cottage garden. Plant yarrow near roses to attach hover flies and ladybirds to combat aphids. Named cultivars such as ‘Peachy Seduction’ and ‘Pineapple Mango’ hint at the new colours available. 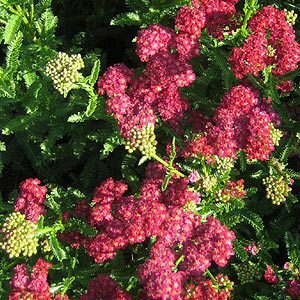 Achillea filipendula ‘Parker’s Variety’ is an old cultivar and can still be found in some perennial seed catalogues. Achillea ptarmica ‘The Pearl’ has white pop pom like flowers and is an attractive addition. Achillea clypeolata has great foliage as well as flowers. Achillea tomentosa the ‘dwarf or woolly yarrow is a matt forming perennial’. Achillea are a very hardy herbaceous perennial (a member of the daisy family). Best suited to cool to temperate Mediterranean type climates and not really good in humid tropical areas. They prefer growing in a humus rich deep soil with good drainage, poor soils are OK as long as they are well drained and yet retain a little moisture. Propagation is easy by division of established clumps in winter to early spring, or from seed. With division it is important to keep new planting watered preferably with a liquid seaweed fertilizer which will help with establishment of new root systems. Great as dried cut flowers, with strong stems and the ability to hold colour well. 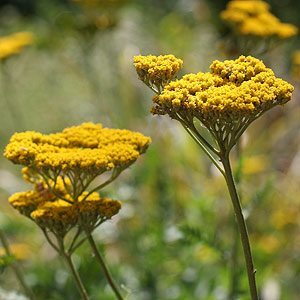 Achillea can be pruned back hard after the first flowering, a second flowering will usually follow. Achillea are great border plant. Range of bright colours from white through yellow, orange, pink and red, fern like foliage. Will tolerate full sun and poor soil.